It's not all weeds and ugly tomatoes here at May Dreams Gardens. I have some very common flowers growing around here, too. Remember how everyone was raving over the Wave Petunias when they first showed up in the garden centers back in the 90's? Wonders what we had! 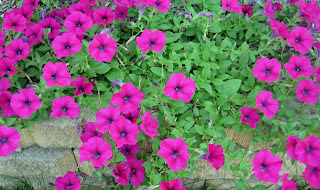 Petunias that just kept blooming without deadheading! And they were perfect for planting where they could cascade over a retaining wall or scramble through a flower bed. They still have those same qualities, so why not plant them? Does anyone besides me else still plant marigolds? I like this color combination. It reminds me of the Swiss guards' uniforms at the Vatican. Aren't their pants striped kind of like these marigolds? I grew these marigolds from seed. Sow 'em and forget 'em, they are that easy. And I like the smell of them in August. It reminds of gardening when I was little, because we always had some marigolds in the vegetable garden. Another flower I start from seed is Zinnias. I posted a picture of a zinnia on my July bloom day post and got a couple of comments from some of our British garden blogging friends across the big pond about how they can't grow Zinnias in some parts of England. Apparently it doesn't get warm enough there for Zinnias. That's too bad because the butterflies love Zinnias and are all over them in August. But my garden isn't just about common flowers, either. There are exotic flowers, too, like my night blooming cereus (Epiphyllum oxypetalum) that bloomed one week ago tonight. And I wasn't here to see it! I had to settle for taking a picture of the bud just starting to open at 5:00 PM and a second picture of the fully opened flower when I got home around 10:30 PM. Apparently, they will not postpone concerts for a big flower blooming event. If I hadn't watched the bloom open two summers ago and last summer, I would have been a bit bummed to not watch the opening of the bloom last week. But, I did get to see the fully opened bloom and smell it once I got home. The night bloomer will never be a common flower here, no matter how often it blooms! I love the simple flowers like zinnias. No Marigolds, but I do understand the memory of childhood gardens they evoke. It's a nice fragrance. I've never seen the Cereus bloom before your photos! I'm definitely into common flowers, though not annuals so much. I've tried zinnias a few times, but they always fry in our heat. 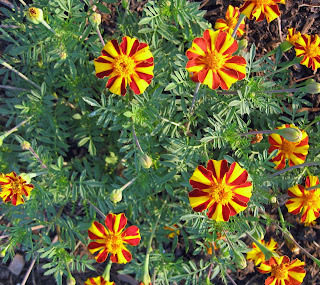 I love those stripy marigolds. Yes, they remind me of the Swiss guards too! What a huge bloom on that Cereus! My grandmother always loves simple flowers like marigolds and petunias so I plant those for her in her garden every year. Wow, great flowers. They are absolutely beautiful. How wonderful to have the night blooming cereus to greet you when you got home from the concert. I love those 'common' flowers you mentioned. Especially the marigolds that don't give up until the frost takes them down for the count. Dropping by to let you know that I mentioned your blog today on my blog, though it's hard to explain what the "mention" involves. The relevant post is this one. I like your "Swiss Guard" marigolds. I've come to the realization that I'm not a big fan of flowers (especialy big bright ones) in the summertime. I gravitate to a lot of lush cool greens...that is, I dream of them. I'd be very happy to hide in a little grotto with a spring flowing into a small pond completely hidden in ferns. I love this post. Last year I reluctantly bought some marigolds to plant at the base of my tomatoes, with exactly the thought they were common cheap flower. But I bought them, I had read that they provide a little protection as a natural bug repellent. This year, I bought them with great enthusiasm knowing that they'd be blooming throughout the summer and adding gorgeous summer color. I think how you plant "common" flowers is also important. I have some very dainty marigolds in a pretty white basket on my patio table. It's like a perpetual centerpiece. Sometimes those little common flowers can provide some uncommon joy! I call marigolds, zinnias and petunias my old standbys. Wouldn't be without them. I can always find a place for them in the garden. Yesterday I watched a hummingbird feed on my zinnias for 30 minutes. I hope never to be without zinnias in my summer garden. Even when the foliage is mildewed and droopy, they continue to bloom prolifically. They also reseed themselves so well that when a plant starts looking ratty, I yank it secure in the knowledge that more will take its place. They're great in a garden where controlled chaos is the general theme! When I was small, in the 30's, Marigolds were not noted for having a flowery aroma. In fact they smelled bad. I'm thinking the not so nice aroma was scientificaly bred out of the flower so that they smell better today. Am I just imagining this, (an urban legend) or is it true. I know science can change a lot of things, better beans, bigger tomatoes, sweeter corn. Can science change the marigold? Does anyone know? I can't imagine a summer garden without marigolds and zinnias. Zinnias, particularly, because the butterflies love them so, and I love the butterflies. I don't have any marigolds, but they're going on the list for next year. I started my zinnias from seed, too, but an aphid outbreak in the greenhouse sacked most of them. The ones that left never cease to brighten my day, though. And petunias! Oh, my heart, be still! I adore petunias. I don't care if they're common and easy to grow - the color is fantastic. While I can't remember when they first showed up (I have a feeling I was more into volleyball practice than gardening), I imagine it must have been very exciting. the striped flowers is just a beauty. I'm definitely a big supporter of the common flowers! They usually grow the best without a lot of extra attention and they are the most likely to volunteer the following year. There's something to be said for their being self sufficient. Thanks all for the comments and support of the common flowers. 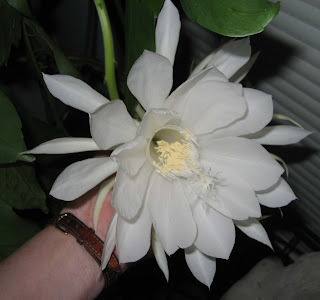 Yes, Kim, the night-bloming cereus bloom is that big and it is pure white. And MSS, I'll have to post green and lush for you sometime soon! YES! Some of us do still grow Marigolds. How can you grow a veggie patch without marigolds to cheer up the veggies? I still use marigolds. They are a great drought-tolerant annual. I like the disco series and the gem series. 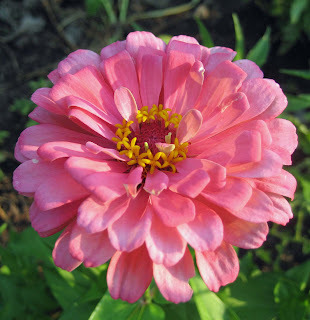 I just did a post on a new Zinnia I grew this year!